“We’re still playing Tuesday. We’re still alive.” That’s Lightning head coach Jon Cooper giving an exhaustive list of everything positive about this opening-round series for Tampa, which could indeed end on Tuesday, just not in a way he or anyone else could have ever predicted. It’s not just that the Lightning are down 3-0 to the Blue Jackets. It’s that the 62-win Lightning, with the most points by any team since 1996, are losing 3-0 to the star-crossed, sputtering Blue Jackets, who have never won a playoff series in their existence, and they’re getting slaughtered. 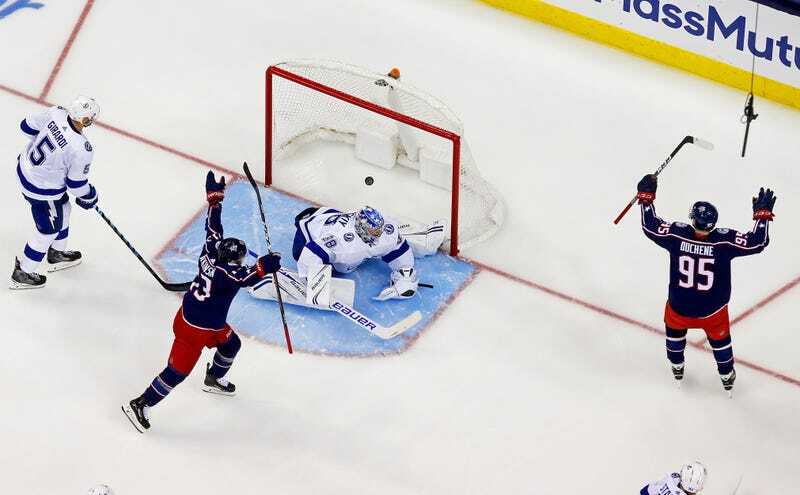 Take out the first period of Game 1, the last time the Lightning looked like they remembered how to play hockey, let alone looked like the Presidents’ Trophy winners that they are, and Columbus is outscoring Tampa 12-2. This is the first time all season that Tampa has lost three games in a row. The Lightning will try to carry over their performance from the third period, in which they tallied 17 shots and halved the deficit, though they couldn’t beat Sergei Bobrovsky a second time. It was the first period since the series’ opening frame that they looked like the better team on the ice, but it’s kind of hard to pin down exactly why the Lightning have been struggling so. They’re getting outplayed in every phase of the game, to the point where if you didn’t know better, you’d say the Blue Jackets were the more talented team. The local paper is blaming Tampa’s pop-gun effort on a lack of “grit,” which is a little tired but also an extremely natural reaction. When a series defies explanation, there’s always an explanation to be found in the intangible. This series isn’t over, or at least it’s less over than it would be in other sports. Four NHL teams have come back from 3-0 series deficits, two of them in the last decade. One of those even went on to win the Cup. If the Lightning are still the best team in hockey (and that’s the sort of thing that doesn’t usually change over the course of a week), it’s not going to be enough. They’re also going to have to perform under adversity and pressure for the first time all year, and they’re going to need to be extremely lucky. Otherwise, a historically good team is going to make the bad kind of history.